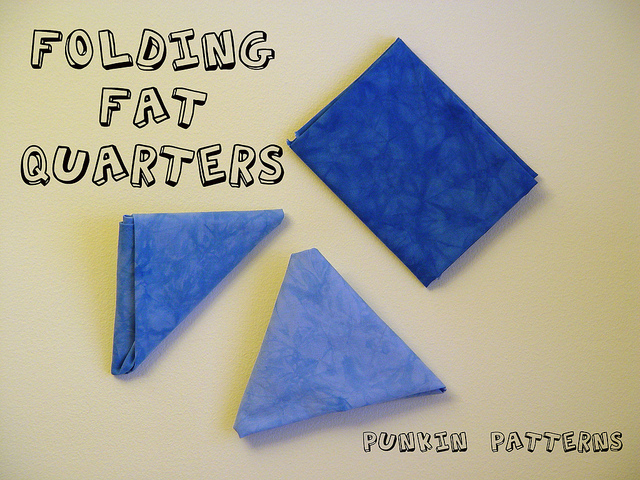 There are lots of ways to fold fat quarters. Since I recently dyed 20 fat quarters, I decided to show you three different ways to fold fat quarters. I like these three because once folded, they lay flat. 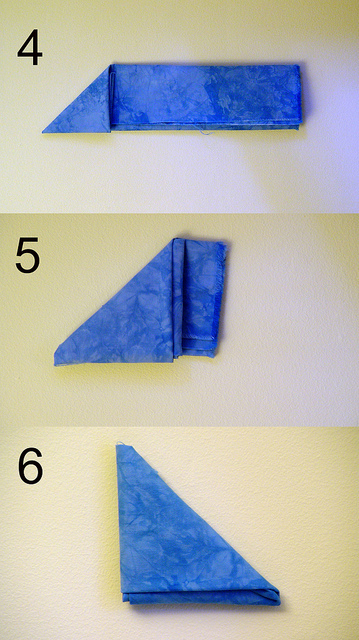 As I mentioned, there are MANY ways to fold them — here’s just three ways. First we’ll look at what I’m calling the standard way (A). I’m referring to it as the standard way simply because it’s the most common way you see them folded at shops and in my opinion, the easiest way to store them stacked on a shelf. Start with the fat quarter laying right side down, orientated so that the height of the fat quarter is longer than the width. 1. Fold in half (fold is at the top). 2. Fold in half again, folding the bottom up, almost all the way to the first fold, but not quite. 3. Fold the ends on each side in, meeting at the center. 4. Fold in half, folding the raw edges into the fold. 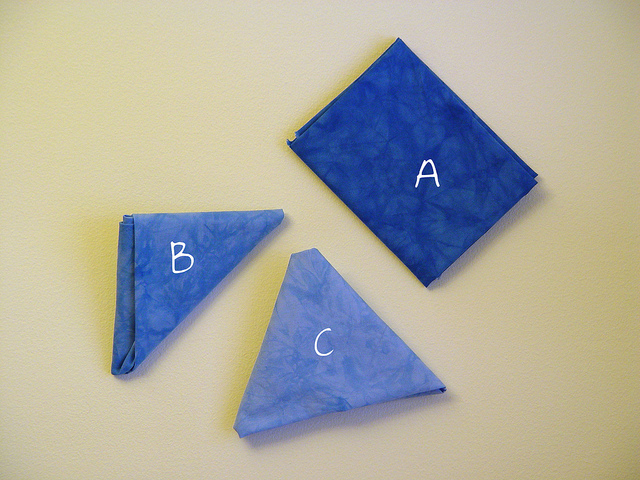 Another method to fold the fat quarter is a mini triangle (B). This is a right isosceles triangle and a nice way to fold for giving the fat quarter as gifts. Start with the fat quarter lying right side down. Orientate the fat quarter so the longer side is going left to right. 3. Start folding into triangles by folding the bottom up so that the left side of the fabric is now alined with the top edge. Continue folding. 4. Continue folding the triangles in line with the fabric. 5. Stop when you’ve reached the end and there isn’t enough fabric to make another triangle. 6. Tuck the extra bit of fabric into the folds of the triangle. It will hold itself together. The last method I’ll show you is my new favorite – the equilateral triangle (C). I purchased a fat quarter from a friend and this was how it was folded. I carefully unfolded it so I could see how to fold it back up that way. 3. Slightly fold in both ends so that the bottom angle is roughly 60 degrees. 4. Start folding both ends in toward the center, similar to the mini triangle, but folding with 60 degree angles to create an equilateral triangle. 5. Continue folding both ends toward the center. 6. You should end up with both triangle folds touching each other. 7. 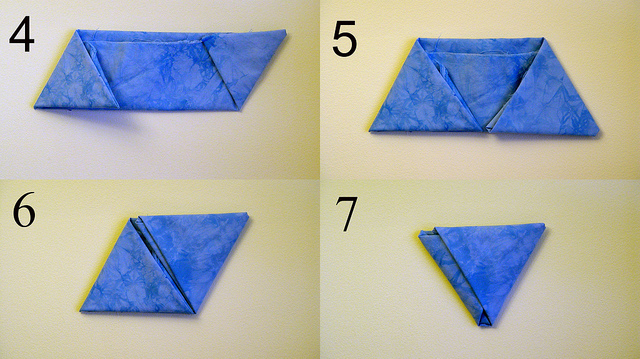 Simply take one side of triangle folds and tuck them into the other side. This will stay held shut and makes a nice way to give fat quarters. If you’re giving more than one, you can pile them up and tie them with ribbon or baker’s twine. 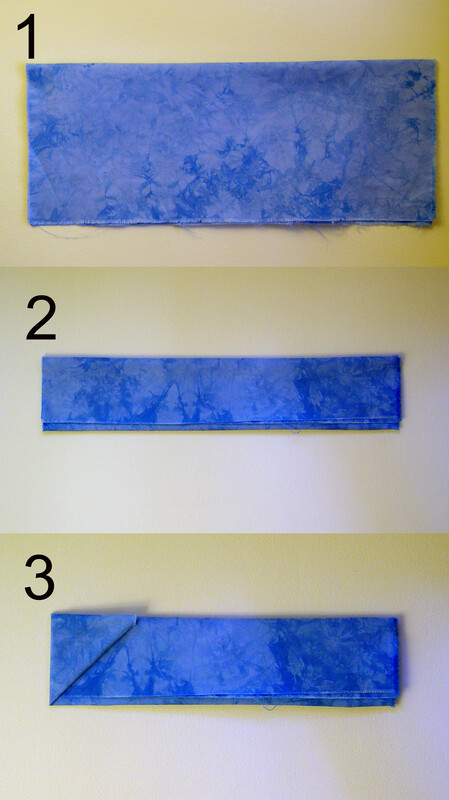 Lastly I’ll just mention one final way of folding or rather rolling your fat quarter. Follow steps 1 and 2 (directly above) and then simply start from the left and roll it all the way to the right and tie it with a bit of ribbon or baker’s twine. Hope you found this useful! Let me know if you have any questions. This was very useful information – thank you for sharing. 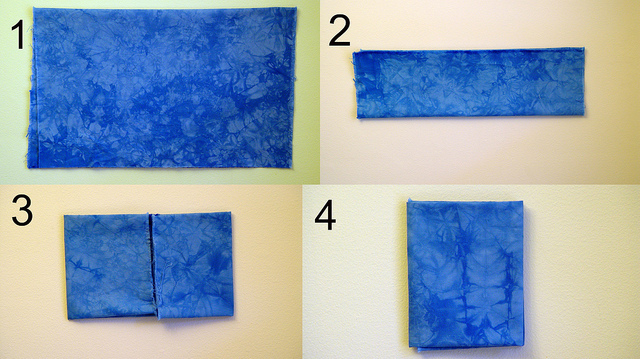 How fun to find a guild friend’s tutorial when looking for Fatquarter folding techniques! Thank you Vanessa!